The engine is the heart of a car, which means without it a car is completely useless. To hold the heart of the car in place you need strong links that don’t let the engine fall on the ground. These links are called engine mounts and they are responsible for keeping the engine tightly in one place. Engine mounts can be found in every shape and size but they all do the same job and that is to discourage engine vibrations from spreading out to the rest of the car. That’s why engine mounts are made with a combination of both metal and rubber. The metal is responsible for withstanding the weight of the engine and securing it in place even when extreme torque is applied by the engine. The rubber part, on the other hand, is responsible for reducing vibrations from reaching elsewhere. After understanding the functions of an engine mount, it should be clear that some symptoms might arise as a result of engine mount failure. We have created a list of symptoms which are most commonly found with such failure. The symptoms are a clear-cut warning for you to get your car fixed before further problems start to arise. The engine mounts are in place to reduce the amount of noise the engine makes, so if there is any unnecessary noise reaching you, there has to be something wrong with the engine mounts. This is especially true when you hit a bump or pothole hard and there is loud clattering in the engine bay. You should contact the mechanic as soon as possible if you hear something like this as a failing engine mount can create lots of damage if not repaired on time. The engine mount is supposed to dampen and reduce the vibrations of an ignited engine. So, if you are feeling more vibrations inside the car than usual, there is probably something wrong with the rubber in your engine mounts. Rubber is a component that can wear out due to friction and extreme stress. 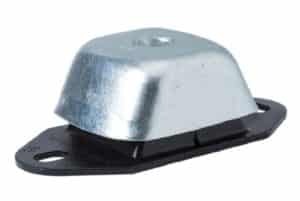 The engine exerts both on the engine mounts so it is natural for the rubber to wear out and fail to cause its vital functions to deteriorate. Solving engine mount failure is not easily accomplished. Most times you cannot even see the mounts from the top, so you can’t tell just by looking if something has gone wrong. Therefore, making a visit to the mechanic can be your only retreat. Repairing or replacing the engine mounts is the last resort. When you have tried everything else and all have failed to give you the desired result, it is time to think about a serious repair. The first thing to notice here is that engine mounts are made of a mixture of two components metal and rubber. If there is a crack in the metal part from the constant torque exerted by the engine, you have to look at a possible replacement. And the thing about replacements is that they cost a lot. That is not because the engine mounts are very rare and difficult to find but because the labor work required to replace the mounts is very strenuous. Your mechanic will have to lift up the engine via a pulley and chain and hold it afloat while he inspects and changes the engine mount. Even a small thing such as an inspection will require your mechanic to lift up your car and look underneath. Seeing the nature of this operation, the mechanic will ask you for a lot of money. For a typical engine mount replacement, the mechanic will bill you around $200 – $500 in labor costs and then you have to add in the cost of the engine mount itself. Fortunately, the part itself costs around $100 to $300, so you are looking at a total cost of around $300 – $800. Keep in mind that the cost of repairs is directly proportional to the make and model of your car and the part’s availability.